Blue mold is a fungus disease caused by Penicillium expansum. 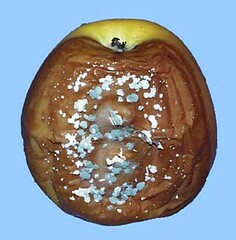 It is the most economically important post-harvest decay of stored apples in the United States. The losses from this disease can be significant but can be substantially reduced by following proper sanitation and control measures. The fungus not only causes fruit decay but also produces the carcinogenic mycotoxin patulin. This toxin may rise to unacceptable levels in fruit destined for processing and may result in off flavors. Figure 1. 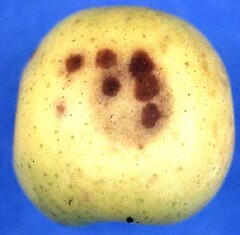 Blue mold caused by Penicillium expansum on 'Golden Delicious' apple. Photo: Wojciech Janisiewicz, USDA. Most species of Penicillium produce similarly appearing decay (fig. 1). The rotted areas are soft, watery, and light brown. The surface of older lesions may be covered by bluish green spores that initially are nearly snow white. The lesions are of varying shades of brown, lighter brown on the yellow or green varieties and on the pale cheeks of colored varieties and darker brown on the most highly colored varieties. The soft, watery consistency of the rotted tissue seems to be a more distinguishing feature than the color variations. Two identifying characteristics of P. expansum, the most common species, are the musty odor and the formation of conidial tufts or coremia on the surface of well-developed lesions. Under cold storage conditions, blue mold lesions (from wound infections) caused by the common species may be expected to be 1 inch to 1-1/4 inches in diameter 8 to 10 weeks after infection. All of the blue molds are primarily wound parasites, most frequently gaining entrance through fresh mechanical injuries such as stem punctures, bruises, insect injuries, scratches from pickers' fingernails, necrotic tissues of diverse origin, or normal stems or open calyx canals. Sometimes infections occur through lenticels (fig. 2), especially when the lenticels are damaged by cracking after a sudden abundant supply of water following a period of dryness, or after bruising late in the storage season when fruit have been weakened by ripening and aging. Figure 2. Lenticel infections caused by the blue mold pathogen. Photo: Wojciech Janisiewicz, USDA. The blue mold spores are long-lived and may survive easily from season to season on contaminated bins, where the fungus can grow and produce copious numbers of spores. Contamination with these spores may come from various other sources, including orchard soil carried on bins from the orchard, decaying fruit, or air. Inoculation of the fruit going into storage likely occurs mainly from the drenching solution used for protection against superficial scald, where the spore concentrations increase with each successively drenched bin and may reach high levels if solutions are not changed regularly. Also, inoculation can occur during fruit handling in water contaminated with the fungus in packinghouses. A single decayed fruit may contain enough spores to contaminate water on the entire packing line. Rapid cooling and storing of fruit under controlled atmosphere conditions reduces the development of blue mold. Cold temperatures have a much greater inhibiting effect on the initiation of infection than on decay development. Fruit under controlled atmosphere conditions maintain natural resistance to blue mold longer than fruit placed in regular cold storage. Maintaining proper storage temperatures and marketing fruit before decay develops may further reduce losses. Traditionally, growers have used post-harvest treatment of fruit with fungicides as the most common method of combating blue mold. However, a variety of methods and procedures are effective in reducing this decay, and many of them can be combined for overall improvement. Original text by Wojciech Janisiewicz and A. R. Biggs.